In Tagal, Chad, an IDP community meets under a tree. More than 100 persons had to flee from one of the small islands in Lake Chad after Boko Haram insurgents attacked their village. To bring an end to the Boko Haram threat in the Lake Chad Basin region, affected countries must address the root causes that contributed to the emergence of the group, including the social, economic and political grievances of marginalized communities, the top United Nations political affairs official said today. “A military approach, while essential, will not bring end to the Boko Haram threat,” Jeffrey Feltman, the Under-Secretary-General for Political Affairs, told the Security Council in his briefing on peace and security in Africa. He said the Boko Haram crisis must be addressed holistically and beyond “an exclusively security lens” and that Lake Chad Basin countries – Cameroon, Chad, Niger and Nigeria – need international support so that military operations are followed by stabilization measures and restoration of state authority. Attacks by Boko Haram continue, mainly in north-eastern Nigeria and southern Niger, and to a lesser extent, in northern Cameroon and the Lac region of Chad, he said. Terrorists persist in targeting innocent civilians, including through suicide attacks, often using young children. Despite commendable regional efforts, the group continues to threaten regional stability, as illustrated by the 3 June attack on a military base in Bosso town, south-eastern Niger. The regional offensive involving Chadian, Cameroonian, Nigerian and Nigerien troops operating under the Multi-National Joint Task Force (MNJTF), has recaptured 80 per cent of areas once under Boko Haram control, freed thousands of captives and prevented terrorist attacks. Mr. Feltman said, however, that Lake Chad Basin countries have expressed their growing impatience over delays by international partners to support the MNJTF financially, as the Force’s success depends on timely and actionable intelligence as well as specialized counter-terrorism skills and equipment, given the evolving tactics of Boko Haram. The UN and the five countries from the Sahel – Burkina Faso, Chad, Mali, Mauritania and Niger – will together produce the outline of a capacity building framework for counter-terrorism and prevention of violent extremism, including concrete regional projects, he said. The Second Regional Security Summit for the Lake Chad Basin held on 14 May in Abuja, reaffirmed the need to address the root causes. Among the noteworthy recommendations was the need to utilize the services of community and religious leaders to discourage impressionable youth from being radicalized and to lead de-radicalization programmes. On the human rights front, Mr. Feltman said the UN has received reports of increased incidents of sexual and gender-based violence among the displaced. States must adopt measures to protect civilians and respect due process when dealing with persons arrested for Boko Haram-related charges. Children used by Boko Haram should be treated as victims and dealt with in accordance with international standards for juvenile justice. The Boko Haram crisis has devastated the region’s economy, he went on. Economic growth dropped sharply with the decline of oil prices and other commodities. Decreasing resources affects the states’ ability to deliver basic social services and to pay the salaries of security forces and civil servants. Insecurity has disrupted trade routes between Chad and Nigeria, interrupting the supply of basic goods and producing price hikes. Youth unemployment is at a worrisome high, providing recruitment ground for Boko Haram, Mr. Feltman noted. Also briefing the Council was Stephen O’Brien, Under-Secretary-General for Humanitarian Affairs and Emergency Relief Coordinator, who stressed the need to urgently strengthen international attention on the “neglected” situation in the Lake Chad Basin, which hosts Africa’s fastest growing displacement crisis. Across the Lake Chad Basin, the UN estimates that over nine million people need humanitarian assistance, he said. About 2.8 million of these people have been displaced, fleeing violent attacks in their towns and villages. Children are particularly vulnerable, especially the 1.7 million children who have been displaced across the Lake Chad Basin. Nigeria is bearing the brunt of the crisis, he noted. Nigeria accounts for seven million of the nine million people in need across the Lake Chad Basin. Last month, the Nigerian authorities rightly declared a nutrition emergency for Borno state. Direct reports from the field indicate that affected communities are rapidly running out of food. In Niger, one single attack by Boko Haram left over 70,000 people displaced in Bosso town in June this year, bringing the total number of displaced people in the Diffa region to over 160,000. Niger is the poorest country in the world; yet despite living on virtually nothing, families there have welcomed the displaced into their homes, and shared their meagre supplies of food and water with the newcomers. The UN humanitarian chief also said that needs are also dire in Chad’s Lac region, where there are over 60,000 registered displaced persons, and tens of thousands who have not yet been registered. In the Far North region of Cameroon, which has been under a state of emergency and lock-down for security reasons, the number of people in need of immediate food assistance has quadrupled since June 2015, to over 200,000 today, and the total number of internally displaced persons has increased in the same period to around 190,000. Humanitarian actors have been scaling up their assistance, despite a dangerous operating environment. It is urgent to complement their efforts with increased development assistance. “We all know that the humanitarian response in itself is insufficient to re-establish people’s lives and livelihoods,” he said, stressing the need to move from delivering aid to ‘ending need,’ a crucial outcome for the World Humanitarian Summit. That means that, in parallel to providing life-saving assistance and protection, political actors must address the root causes of the violence, and development partners must address the drivers of vulnerability across this region. 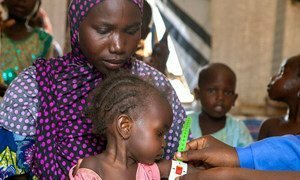 About a quarter of a million children in Borno state, north-eastern Nigeria, are suffering from severe malnutrition, the United Nations children’s agency today announced. Of those, about one in five will die if they do not receive treatment.